The "Add to Cart" button will take you to a PayPal secure transaction page where you can change the number of copies you wish to purchase and/or pay by credit card. 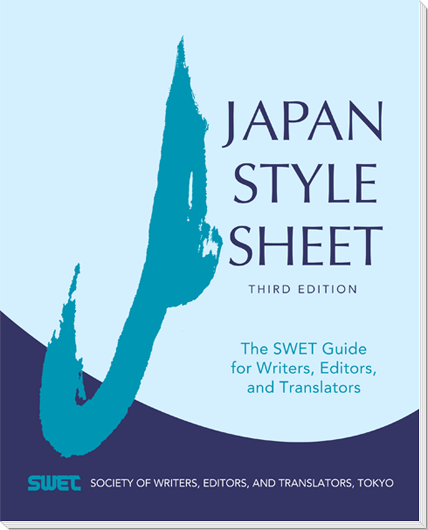 Current SWET members may order one print copy of the Japan Style Sheet free of charge. Send an email to member_JSS with the subject line “member_JSS”; please write your name and postal address in English or Japanese in the body of the email. Anchor your Japan-related writing and publishing endeavors in tested practices and informed choices. The updated and expanded third edition of the JSS provides authoritative support for translators, editors, writers, and others working with English-language texts concerning Japan.
. . . etc., etc. . . .
N or M: Shinbun or Shimbun? See also the dedicated website japanstylesheet.com. Credit card You can pay by credit card through PayPal, even if you do not have a PayPal account. Please use one of the buttons at top of this page. Postal transfer In Japan, remittances may be made by post office deposit (yūbin haraikomi). The necessary forms are available at all Japanese post offices. The account number is "SWET no Kai 00100-8-0042202." Important note If you pay by postal transfer, please send an email to purchase_jss@swet.jp giving your name and postal address in English or Japanese. Important note If you pay by bank transfer, please send an email to purchase_jss@swet.jp giving your name and postal address in English or Japanese.